Certified American Grown is Leveraging Pinterest, Are You? Certified American Grown has been working diligently to grow our presence on Pinterest, and we’ve seen a great return on our efforts, creating a monthly viewership of over 14,000 in just three months. We’re finding this platform is a great way to share the #originmatters message, and of course the amazing photos of Certified American Grown Flowers and Greens. And we expect this number to continue to grow as we deliver new content to the platform, interact with users and leverage analytics to share more of the photos, products and stories users are interested in. We’re posting great tips on floral topics like boutonniere bars, flower crowns, floral photo backdrops and tablescapes, to name a few. The success we’re having on Pinterest prompted us to ask: Are you leveraging Pinterest for your business? Social media pro K.C. Cornwell points out that Pinterest is often an overlooked social media platform, largely because many businesses aren’t quite sure how to use it. But there’s hope. Verify your website. Claiming your website on Pinterest gives you access to the analytics feature that allows you to see what content viewers save the most and which posts send the most traffic to your website. It also causes your profile picture to show up on any pins that come from your site, allowing consumers to find your account and your brand more easily. Pin a mix of content. Pinterest is a virtual pinboard, a place for discovering and curating ideas, goods and goals. It’s considered “spammy” to pin predominately your own content and the site will stop showing your pins if they’re all from your own website. Instead, pin a mix of your blog posts or products along with other items your customers might be interested in: weddings, home design, travel to your area, decor, etc. Create “optimized pins” for your content. Optimized pins are vertical images that incorporate descriptive text with attractive photos that relate to the webpage they are linked to. The optimized pins can be added to your website or uploaded directly to Pinterest and linked. Are You Following Farmer Fridays? 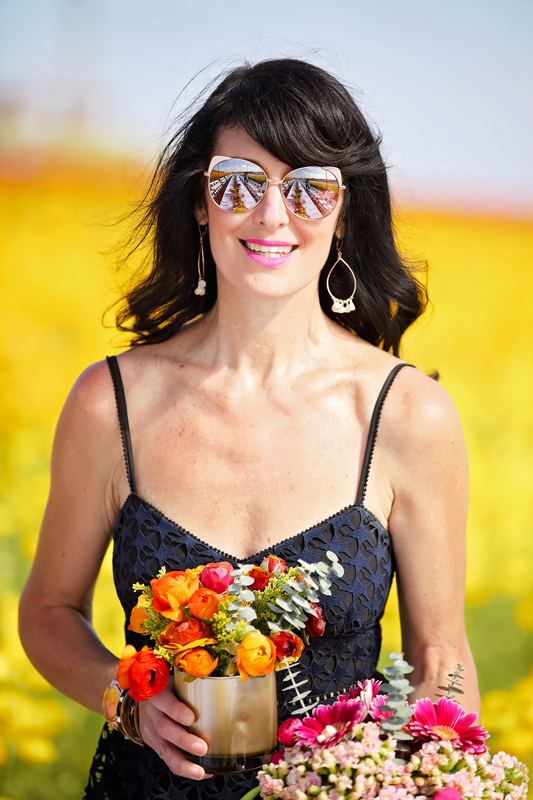 Don’t Miss These Stories of American Flower Farmers! Every Friday across our social media channels, we’re celebrating American flower farmers with Farmer Fridays! These stories on Facebook and Instagram highlight Certified American Grown flower and greens farmers, the varieties they grow, the sustainable methods they use and why they love to grow fresh flowers and greens. Click on the image above to see this post and more on our Instagram page. It’s our way of sharing the bounty and diversity of homegrown flowers, and connecting followers to the age-old art and science of flower farming in America. Are you following Farmer Fridays? Doing so will not only surprise and delight, it just might connect you to those special blooms grown right here in the U.S. These are also great stories that you can share too. After all, we’re finding these posts are engaging audiences and spreading far and wide, so we certainly encourage you to share these stories on your social media platforms as well. Click on this image to see the post about Kitayama Brothers and others like it on the American Grown Flowers Facebook page. Highlighting your connection to the farm, our farmers and their flowers is a powerful connection for your customers to see. Find these stories and more at @AmericanGrownFlowers. The company that is now Sutton Ferneries got its start more than 30 years ago in the back of a Honda hatchback. It was in that Honda that Michelle Sutton was going door to door to Miami’s florists selling ferns that her former husband’s family was growing on a farm in central Florida that they had recently bought. Sutton would receive the foliage via the U.S. mail and then put it in her home’s bathtub with ice to keep it fresh until she would make her rounds. That was the humble beginnings of Sutton Ferneries, a Certified American Grown farm, that now employs 130 people at its farms in central Florida and its processing facility in Doral, Florida. It sells its ferns and foliage to retailers, wholesalers and mass-marketers in the United States and around the world. All that hard work in going door to door amounted to an education in the floral business that formed the basis of Sutton Ferneries. The team at Sutton Ferneries. Photos supplied by Sutton Ferneries. Sutton has flipped the usual model of being a grower that has expanded its sales. One of the catalysts for the company’s growth was timing. In those early days, Sutton’s contacts with Miami florists eventually led to businesses that were just starting to make bouquets for supermarkets. “Once we got in with them, we start started having problems with supply. We didn’t have enough supply,” she said. While seeking new farms to buy from, Sutton discovered she couldn’t get the quality she needed. Buying ferns in bulk resulted in too much waste. Her customers weren’t traditional wholesale buyers. They were using every single stem. It was a challenge to get growers to understand that Sutton wasn’t just being picky or trying to cherry pick their crops. The company was just responding to the market. That led to Sutton getting into the growing business. At first, they leased acreage from an existing grower before buying their own property and adding to it over the years. They now have about 100 acres. Sutton Ferneries consists of 100 acres of ferns and foliage sold to retailers, wholesalers and mass-marketers in the United States and around the world. “We learned the (growing) business, from getting cutters to crew leaders to packing and the whole operation,” she said. By the mid-1990s, Sutton Ferneries had established itself. Since then, it has had to adapt as demand and tastes have changed. As the bouquet business shifted to South America in the mid-1990s, Sutton turned to creating new products, such as its Ready to Go Greens, which are premade arrangements of greens that require retailers to just add flowers. Sutton has also embraced the supermarket sector as the business has shifted away from traditional flower shops. During her career, Sutton said she has seen retail florists in Miami dwindle from about 1,500 to less than 60. Although florist shops make up a smaller part of her business, Sutton still sells to some of the same florists she started selling to from the trunk of her car. She appreciates the lessons they provided her when she was starting out. Sutton is proud the company has continued to grow in the face of harsh blows delivered by Florida’s sometimes devilish weather. The company has survived the Storm of the Century in 1993 and multiple hurricanes, tornadoes and freezes. The risk is so great that business insurance isn’t available, Sutton said. “We’ve been through multiple catastrophic losses over the years between freezes and hurricanes,” she said. “You name it, we’ve gone through it. When a Flower Farmer Goes to Washington, D.C.
A very interesting and productive trip took place February 25-29 when a delegation of flower farmers went to Washington, D.C. I was among them. Carolyn and Quinton Tschetter were an integral part of the 2019 DC Fly-In, bringing the concerns of flower farmers to Capitol Hill. Photo by Nony Park of Ken Pak Photography. A very productive meeting was had with Cut Flower Caucus Co-Chair, Congresswoman Jamie Herrera-Beutler of Washington state. Photo by Nony Park of Ken Pak Photography. From my personal perspective, the best, most productive meetings I was involved in were with Congresswoman Jamie Herrera-Beutler of Washington state, a co-chair of the Congressional Cut Flower Caucus; NASS, the statistics branch of the USDA; Under Secretary of Agriculture for Trade and Foreign Agricultural Affairs Ted McKinney; and representatives of the U.S. customs and border protection group. Under Secretary of Agriculture for Trade and Foreign Agricultural Affairs Ted McKinney took time to meet with our farmers and showed great interest in their concerns. Photo by Nony Park of Ken Pak Photography. McKinney was very receptive and knowledgeable and our discussion with customs and border protection representatives was very deep and interesting discussion. I have to say, our meeting with these folks started out with a strong defense of their position and abilities, but seemed to come around to an understanding that they were not accomplishing what they thought was their mission of protecting the integrity of “country of origin” labels. Photo by Nony Park of Ken Pak Photography. It was so satisfying to see the success of our group in presenting the core concerns of American flower farmers over the several days we were there. The unity within the group was refreshing and our concerns were well-received at least 90 percent of the time. Quinton helped create boutonnières for the Wine & Flowers Reception hosting representatives and their staff and inviting them to join the Cut Flower Caucus. Photo by Nony Park of Ken Pak Photography. The one issue that’s yet to be realized, even though it was well-presented, is whether we will be successful in getting the White House to commit to exclusively using American Grown Flowers for their events. I look forward to hearing the outcome of that very important ask. Quinton and Carolyn Tschetter after a meeting with Senator Joni Ernst’s office. Bottom line: Our efforts to Make American Flowers Great Again seemed to be successful. I encourage other flower farmers to join the team next February for the annual fly-in. Michelle Morton is an Alaskan peony grower by way of Los Angeles, Australia and Scotland. She put down roots in the state and eventually bought five acres in Homer, which would eventually become the home of her business, Stone Circle Peonies, a Certified American Grown flower farm. The property was filled with dead trees, the victims of a beetle infestation. After she cleared the trees, she was left with land she didn’t know what to do with. It called out, however, to her lifelong love of gardening. She started with a small vegetable garden. That eventually led to enrolling in the USDA’s high tunnel program, where the government reimburses growers for building the enclosed structures that allow produce to be grown in a protected environment. It’s a four-year program, “where they’re basically teaching you how to farm,” she said. It was also a time when peonies were exploding in Alaska. Morton found herself a budding farmer in a suddenly fertile flower-growing environment. Peonies had taken off in Alaska after a government pilot project in the early 2000s found that the flowers thrived in the state’s long summer days and were ready for harvest in July and August, a time when the rest of the world’s annual supply of peonies had been picked, sold and used up. It also coincided with the peak of the wedding season, which the big, showy blooms seem tailor-made for. And the flowers were relatively light weight and perfect for export via air. Alaska went from zero peony farmers in 2004 to more than 200 by 2014. Morton was part of that boom. She planted a quarter-acre in 2012, and nurtured her plot for the four years it takes to develop a commercially viable crop. The learning curve, however, was steep. “Everest steep,” she said. She’s grateful for the kindness of Homer’s other peony growers. Three years ago, she harvested a thousand blooms. Last year it was 6,000; this year, she figures the number is 10,000, and she sold all of them. She manages to keep the farm going with just the help of her two children, Fiona, 14 and Seamus, 12. Fiona designed Stone Circle Peonies’ website and does much of the marketing via Instagram and other social media platforms. Both she and Seamus help out in the fields. Morton sells the flowers to florists, flower designers and directly to consumers in the lower 48 states, and has her eye on the international market. How Will You Promote This Flower-Giving Holiday? Women’s Day, coming Friday, March 8, is a day to honor and recognize women’s achievements, and to celebrate the women in our lives by expressing our respect, appreciation and love. With efforts internationally dating back as far as 1908, the observance of Women’s Day in the U.S. continues to grow, as does its status as a flower-giving holiday. Efforts to market Women’s Day as a natural floral holiday in the U.S. began in earnest in 2010 with help from Lane DeVries at Sun Valley Floral Farms. Since launching the initiative, retailers, wholesalers and other companies have joined efforts to grow the holiday and raise awareness and consumer interest in celebrating it with flowers. After all, Women’s Day is a natural fit for the flower industry, and its timing helps bridge the gap between Valentine’s Day and Mother’s Day – the two biggest flower-related holidays in the U.S.
At Whole Foods in Landover, Michigan, Women’s Day is a relatively busy holiday, according to Diana Westcott. To drive sales, they’ll be offering two, 10-stem bunches of Certified American Grown tulips for $10, as well as a Phalaenopsis orchid plant grown in New York for $12.99. At Bloem Decor in Sacramento, California, owner Liezet Arnold, a past designer for the American Grown Field to Vase Dinner Tour, will be giving a free California Grown rose with every Women’s Day purchase. Ashely Atelier of Atelier Ashley Flowers. Photo courtesy of Atelier Ashley Flowers. Ashley Greer, owner of Atelier Ashley Flowers in Old Town Alexandria, Virginia, will celebrate Women’s by designing floral centerpieces for the annual Dress for Success Congressional Suit Challenge and Power Breakfast in Washington, D.C. Dress for Success is an international nonprofit that provides women professional attire and job skills to succeed in the workplace and life. For the past 20 years, Dress for Success has supported women in 150 cities and 30 countries. In addition to providing event florals, Greer is collecting business suits and work attire to donate at the event. Ready to promote join these innovative florists and retailers in promoting Women’s Day? Check out this resource page with information and advice to help you promote this flower-giving holiday! Certified American Grown and America’s flower farmers congratulate President Trump on his State of the Union speech. We continue to appreciate his commitment to American businesses and American workers and we welcome his bold declaration that the theft of American jobs and wealth is over. America’s flower farmers respect President Trump’s goal to level the playing field in all future trade agreements such as the USMCA and in ongoing discussions with China. We support President Trump’s “America First” trade policy. We’re hopeful that this administration will finally end the unfair trade practices that have adversely affected American flower farms and have marginalized the value of the American jobs they produce. America’s flower farmers have spent the past 30 years fighting to maintain their livelihood in the face of trade agreements such as the Andean Trade Promotion and Drug Eradication Act (ATPDEA) that sacrificed this iconic American sector of agriculture to reduce drug trafficking. Sadly, drug production in these Andean countries remains at an all-time high. Debi Lilly florals are found throughout Albertsons companies floral departments. Albertsons recently added the BloomCheck certification program to its list of approved sustainability certification programs used to certify the plants, flowers and greens sold through their Debi Lilly line of floral products. BloomCheck provides retailers and their customers with a third-party certification that assures that farms are not only following the high standards involved with agriculture production in the United States, but are also committed to continuous improvements in best practices involved with growing flowers and plants. Farms that complete the BloomCheck certification have undergone a complete review of their production practices with an “on-farm” auditor from Protected Harvest. Protected Harvest is a third-party nonprofit organization responsible for accrediting BloomCheck’s standards and providing the third-party auditors involved with the verification of our farms’ practices. Let's Go Big In 2019! Thanks to all of our Certified farms, 2019 represented our best year yet! With so much grown and success, 2019 is shaping up to be even better! Certified American Grown is only as successful as the farms that are engaged, leveraging and promoting their affiliation with the campaign. So, we compiled a list of the Top 10 ways you can leverage your certification for growth and success in this new year. Certified American Grown is not a happy talk program. Designed to drive sales and win back marketshare, Certified American Grown is the only guarantee in the floral industry that promises a 3rd party guarantee for consumers and your customers that the flowers they are purchasing were grown and assembled here in the United States. # 2 Promote the Celebration of American Grown Flowers Month! Proven to drive sales! Encourage your customers to avoid the “summer sales slump” by celebrating and promoting Certified American Grown Flowers all month long. Have mass market customers? Have them sign up for this year’s merchandising contest. # 3 Advocate for Your Farm in Washington, D.C.
Join your fellow farmers for two days in our nation’s capitol, helping us to raise the profile of America’s flower farmers. This dedicated effort has proven to be effective in driving awareness and increasing opportunities and resources for our farms. This year we’re going to the White House! # 4 Wrap Your Truck! In 2018, we saw some BIG branding efforts with some sweet truck wraps! We have plug-and-play design ready to go for you. Contact Mark Smith and get a quote from Signature Graphics, 615-569-4115. Want to stay engaged each day? Our Facebook Forum attracts designers, mass marketers and farmers who care about Certified American Grown. Consider joining the daily conversation. Already a member? That’s great! Share your experience and best practices with the program and engage with comments! We are always looking for farms to support our efforts in Pasadena. Primarily a CA Grown promotion effort (it is December…), but we had a number of you ask about supporting and help. Heck, we may even have another opportunity to certify an entry American Grown! Join us in 2019! Contact Anna Kalins to volunteer at Anna@AmericanGrownFlowers.org. We are about to launch the 2019 tour, but now is the time to get yourself on the list for this award-winning marketing program in 2020. Applying is made simple on our website. The Field to Vase Dinner Tour is the most successful consumer-facing national promotion program in the floral industry. Bring this spotlight to your farm in 2020. For the fourth year in a row, Certified American Grown will have the honor and privilege to provide our flowers to the 106th First Lady’s Luncheon. This is such a high-profile event and opportunity. We have an amazing team of volunteer designers that will be led by Mary Kate Kinnane of the Local Bouquet. If you can’t send flowers, but you’d like to work with our team of designers, let us know that too. Contact Anna to donate flowers. Contact Andrea to volunteer your time. Certified American Grown is proud to lead international trade missions and explore economic development opportunities for our domestic farms. In 2019, we will be going to SE Asia and South Korea. If you’d like to learn more about these trips, contact Andrea at Andrea@AmericanGrownFlowers.org. #10 Add Your Unique CAG Logo to Your Email, Website, Biz Cards, Etc.